This 1-3/4 inch wide Economy Saver Quick Release Universal Bi-Metal Blade is designed for Flush and Plunge cutting situations. It is ideal for demolition, remodeling and general wood and metal cutting. Use this Bi-Metal blade to cut through nail embedded woods, fiberglass, tubing, PVC, copper piping, metal mesh, sheet metal and other metallic and non-metallic materials. Wider blades are sometimes preferred for maintaining cutting contact as you cut through nail embedded wood. 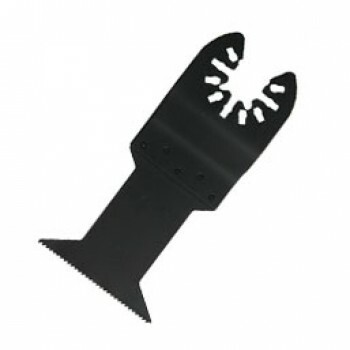 Also use this demolition blade for cutting through fiberglass, PVC, copper pipes, metal mesh and thin sheet metal. The Q045 is a Price Saver Bi-Metal Blade that's great for both Flush and Plunge cutting and is manufactured by laser welding a high speed steel cutting edge onto a flexible alloy steel back extending the life and durability of this blade.